Great Idea for when you have an urge for dessert! Genius! ----- 1-2-3 Cake. I love this idea!!! You need two boxes of cake mix. 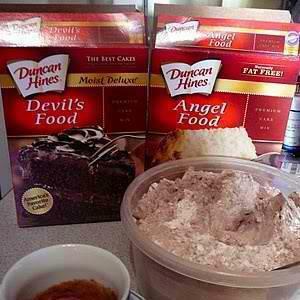 One can be any flavor you prefer, but the other MUST be Angel Food cake mix. Mix them together (shake them in a big bowl). Then simply store the mixture in an airtight container until you get the urge for dessert. Then just put three Tbsp. of the dry mixture in a big coffee mug and stir in 2 Tbsp of water. Microwave it for one minute and you will have a single serving of cake! Top with fruit, ice cream, whipped cream or whatever! Awesome for those of us who want something sweet every now without making an entire cake!! !